Regular reader and friend gunbird18 sent me this pic of his two kids - Nathan and Hayley - playing some DDP over the weekend and it's too adorable not to share. Keep 'em at it gunbird18 - we need some Western shmup record holders! Thank you for the award, drboom! I humbly accept this award! My only regret is that I did not have DDP set up in Tate mode! The ONLY way to play shmups!!! blasphemy for allowing them to play it two player! They'll never learn proper chaining technique with two ships on the screen. Capri-sun, LOL! Naw, they were taking a few sips of Vodka-Dew to loosen their nerves a bit. You know, take the edge off. Sounds like there's an official cocktail in the running for the meet in April! I haven't taken any pictures, but my 4 year old twins seem to prefer DFK Black Label by a considerable margin. They don't seem to appreciate the more rigid chaining of the earlier DDP titles. Sounds like we both need to apply there! I need to take some pics. The kids do seem to prefer Futar BL to DFK. 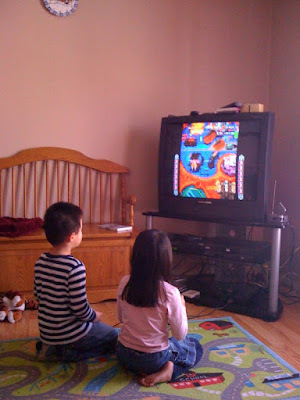 I prefer any DFK variant with autobomb on for the kiddies, but they like shooting the snakes in stage 1 of Futari. Lately they've been making "shooters" out of legos so I'm gonna use them for avatar pics soon. Oh and if you're job hunting.. my company is like 3 people. 3 People? You gus are really spreading out the profit sharing nicely! Well, while not exactly embarrassing..
1) Today while my twin 4 year olds were playing DaiFukkatsu, the wife says: "I wonder if we could get anything like this for their Leapsters.."
2) On the STAGE 4 boss, my son says "Daddy get in here, we need help. This one is HUGE and I don't think we can do it. No, this one is HUMONGOUS!" DFK on Leapster! I think the framerate will drop quite a bit on the 3rd stage! But I'm just assuming this, since I don't OWN DFK!! !